The other day, on the way to school Gus and I had to have a conversation about gratitude. Obviously after I had explained to him what the word actually meant. Because it seems that however much he is given, he still always wants more. He gets a biscuit, he wants another one, he gets to stay up for an extra 10 minutes...he wants another five etc. This is all perfectly normal boundary pushing….yes, yes but then it never stops! Sun – Bowling party with friends, afternoon playing in his Nana’s sunny garden. Meltdown after dinner because he didn’t get anything from the sweet cupboard (which is not a prerequisite by the way!). FYI after he’d been at the party…the party he had consumed cake and a party bag full of sweets at, he’d had a bubble-gum ice cream (btw bleugh). But apparently he STILL felt entitled to a “treat” from the sweet cupboard. Mon – Park in morning / afternoon trip to local National Trust gardens with his best mate, where they had an ice lolly and ran around like hyper loonies for hours. His bezzie was with us for a total of 5 hours of happy lunacy (give or take a few mini strops). When being informed about the impending departure of said friend it was armageddon chez Helicopter. His life is *SO* unfair. How the heck have I created such a spoilt monster?! I can’t believe it! I NEVER thought I’d end up with such a consumerist maniac for a son…but I have and it can’t be anyone else’s fault. The big, ugly finger o’blame is pointing RIGHT at my ugly mug. How though? He’s always been taught to say please and thank you. I try and hammer the manners into him for fear of public embarrassment more than anything else….no one likes the rude kid! I know there’s more to it than that…namely not buying them things ALL THE TIME…. And I confess we used to take the lazy parents route of buying him something little to keep him quiet in the supermarket when stealing grapes lost its charm. So that laid some pretty shaky foundations. 1) Shopping in town…with birthday vouchers, given after having an ace 40th birthday party attended by some of the best people in my life. I could buy anything I liked….literally anything I wanted (money permitting)…. BUT. Instead I kept looking at all of the holiday and beach wear and feeling sick with jealousy because I knew we wouldn’t be having a beach holiday in the sun in the foreseeable future. I genuinely felt tearful for one hot minute. But the irony of that is just awful! I had vouchers to spend on whatever I liked FOR MYSELF AND NOT EVEN MY KIDS! And I still wanted something else! 2) We’re in the process of buying our first house. We are in this privileged position because my parents are helping us out with a deposit. We don’t have a whole lot so we are struggling to stay in the catchment area for the school Gus is in. I have been feeling super sad about the fact that we have to move out of the catchment area and that the house we buy will probably be in a worse state than the current one we rent (which isn’t, by any stretch, a palace). But hang on a flipping minute… we will be owning our own house! We are getting on the property ladder! We didn’t think we would ever own our own house. And there are millions of people who don’t and won’t. Whaaaat? I need to check my bad self right THERE! I have to admit…. Even though it’s awful…. I have spent my whole life dreaming of bigger, better things and feeling a bit sick when I realised I won’t have many of them. That makes me feel SO ashamed. It’s not only ridiculous given how charmed my life has been but it’s also damaging to peace of mind. If you are constantly craving things you don’t have, you can only end up extremely unhappy. 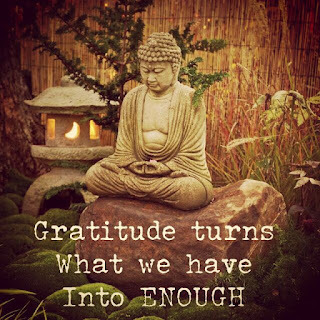 But as I’ve mentioned previously I now listen to meditation apps every night (when I am not gorging on ASMR vids) and one of the reoccurring themes is gratitude. It’s a big part of the teachings of Buddhism and I have to say, it’s hands down my favourite part of the meditation. It makes your life better! When you sit and list 10-20 little (or big) things that you are grateful about that day….however crappy that day has been, you will ALWAYS feel better afterwards. OK so some of you may have zoned out when I mentioned Buddhism…. You’re not interested in that hippy crap! But I promise if you can think of (let’s start small) 5-10 things in this moment that you are grateful for today then you WILL feel a little bit better about your life. The more you do it, the happier you get. So now I have implemented a gratitude exercise at the end of the day. Gus has to list 5 things that he’s grateful for in the day. I need to curb his need for ALL THE THINGS right now before he turns into Verruca Salt. I don't want him to grow into a big, disappointed, greedy monster! And on that note I've had a thought. Perhaps that insincere, over-used, clumsy phrase beloved by the rich and famous "#blessed" COULD be a nod to this need to acknowledge our privileged lives? Or….or…. it could just be a REALLY FLIPPING ANNOYING & GLIB HASHTAG….. I'm with you on the gratitude. I was a consuming nightmare (I say was, I have to keep that gal in her place ALL the time).. I spent my 20s being crazily driven by money and then realised that I was pretty sodding miserable. im now also a big hippy AKA meditator 😂 And I love it. I think so many similar thoughts. I think it's just a natural thing for kids to always want more, there doesn't seem a way to stop it. Maybe it's the brainwashing our society has done to us, if you don't have the best most expensive stuff then you're behind in life. It's nonsense but still doesn't stop me wanting a 4-bed house instead of 3, but then the 4 bed would also need a detached garage.... It continues, I completely get you! Another great post and I like your writing style. Haha your post made me chuckle, however I often feel guilty for the same thing myself with my 4 year old daughter, she often feels entitled to have a treat after every single meal, even if she's refused to eat it, and like you, I also feel like it's my fault, that I made her like this. I think I'm gonna take a look into these meditation apps myself! Yeah do it! They've changed my life! Ah yes, I'm always wanting the next best thing. I had an epiphany this week though, I want to live every day appreciating all of the moments, including the mundane moments. This is because I started work this week after six month maternity leave and every moment with my son is precious and I don't want to take it for granted. It sounds like your son is just a normal kid, I think the gratitude exercises are a fantastic idea!! I think I am going to add this to my routine : ). Thanks so much for sharing with #StayClassy!